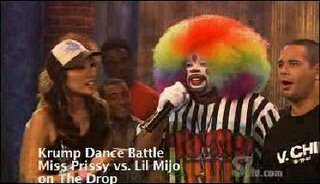 Sitv has put up a clip of The Drop from Season 3 featuring Tommy the Hip-Hop Clown and Jelynn running a Drop Dance battle. The two dancers are Miss Prissy and Lil Mijo. To watch the clip, go to The Drop's show page and click on the image that says "Krump Battle" when your mouse rolls over it. Right now it is the second from the top. Sitv should also put up the clip of Jelynn learning how to Krump. That was educational and entertaining.